Article written by FBS Benefit Consultant Kylor Dunn. You made it! You survived your annual benefits open enrollment and it is all smooth sailing from here, right? Not so fast. Now is the time to take a good look at a few things that will save you time and stress in the near future. When your employees enroll in their benefits, your system should compile a list of their selections to send to each carrier. This can be done in an old fashioned way of data-mining the appropriate information from your system and plugging it into the correct format, but there is an easier way. Electronic Data Interchange, or EDI, is a method of transferring data between different computer systems. It enables the computer system from one company to “talk” to the computer system of another company, and this allows them to digitally exchange data. 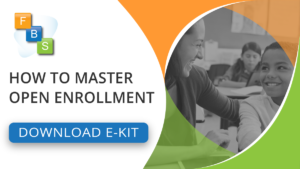 By moving away from a paper-based exchange of insurance enrollment applications to one that is electronic, companies can enjoy some major benefits such as reduced cost, increased processing speed, reduced errors, and improved relationships with business partners. How long did it take you to prepare the election reports for each carrier? Have you had issues with any coverage hiccups from carriers due to data errors? 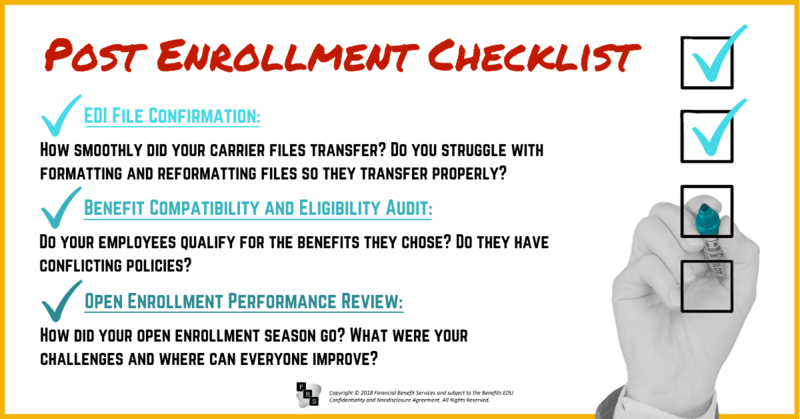 How helpful were your enrollment system administrators in addressing any problems? A successful benefit administration process depends on the efficient transfer of data between systems. If you have a Third Party Administrator (TPA) with strong relationships with their carriers, they are able to perform tests and work with the carriers to accommodate each system requirements for EDI transfers. For example, THEbenefitsHUB has a dedicated team that works with each carrier to either generate a report that meets the criteria of the carrier, or set up an EDI file so the correct information finds its home. As much as you try to inform your employees about their benefits, there will always be mistakes. During a post enrollment audit, you should look for anyone that is enrolled in benefits which they are not eligible for. As an example, if an employee has elected a Health Savings Account (HSA) but did not select a High Deductible Health Plan (HDHP), then you have an issue. There are a lot of combinations that are not allowed by either your carriers or the IRS, so going through each employee selection will help everyone avoid billing discrepancies and possible fines. 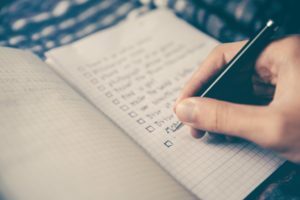 Additionally, this is a great time to make sure all of your life insurance Evidence of Insurability (EOI) cases are closed out with the carrier and you’ve made adjustments to your payroll and benefits systems. 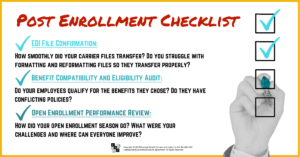 The last item on the post enrollment check list is to evaluate how smoothly things went leading up to and during your open enrollment season. Think of this as a report card for your open enrollment. Did your employees seem prepared? Could you have done more to educate them on their benefits? Were there any issues with your enrollment system? These are all important questions to ask yourself and your team. This is the perfect time to assess what went well and make plans to fix any issues and improve in areas that were inadequate. You may also want to use this opportunity to give a report card to your TPA. How much did your Third Party Administrator do to help you in this busy time of year? Could they have given you more resources to educate your employees or provided enrollment assistance? Depending on how good your TPA’s report card is, it may be time to start shopping for a new consultant. Previous Rhetoric v. Reality: What is the Future for the Employer Mandate & Reporting?